labs. NukeView. . . | andrewANDORU. . . When dragging an image from a sequence onto NukeView it only seems to bring up 1 frame of the file. It automatically sets the frame range of the comp to (1,1). File naming convention is “SHOW_EPISODE_SCENE_SHOT_VERSION.0000.dpx” any reason why this might be? 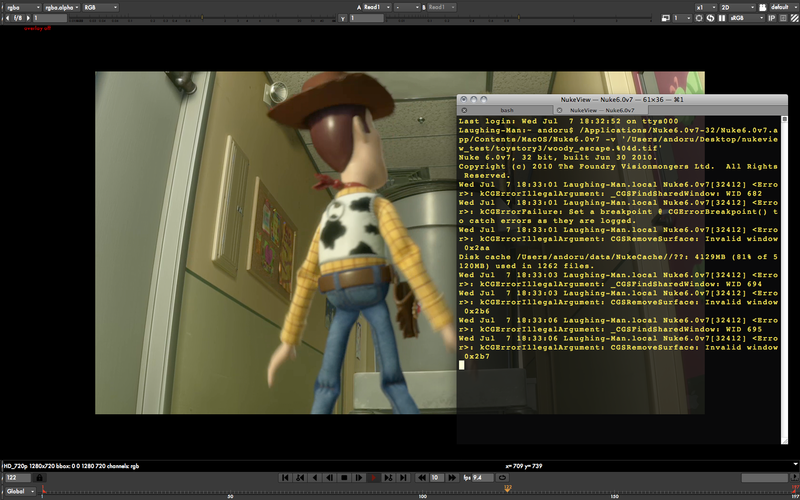 Using Nuke6.3v1. Thanks! “executable alias”?, when i right click i dont get anything that “says” this term, i see a NukeView.icns image in the resources file , is that it?, but my bad because when i try to follow these types of instructions on line there is invariably some code speak that throws me off, its just not really clear to some of us, maybe just dummy it down that little bit. really neat app though, hoping to be able to use it if you could hit me back on that one questionable bit, thanks dude! You probably haven’t checked the “sequences” box at the bottom in the read menu. If this box is not checked, you can only load the data you select (in your case: only the first frame). Checking the “sequences” box should solve your problem!